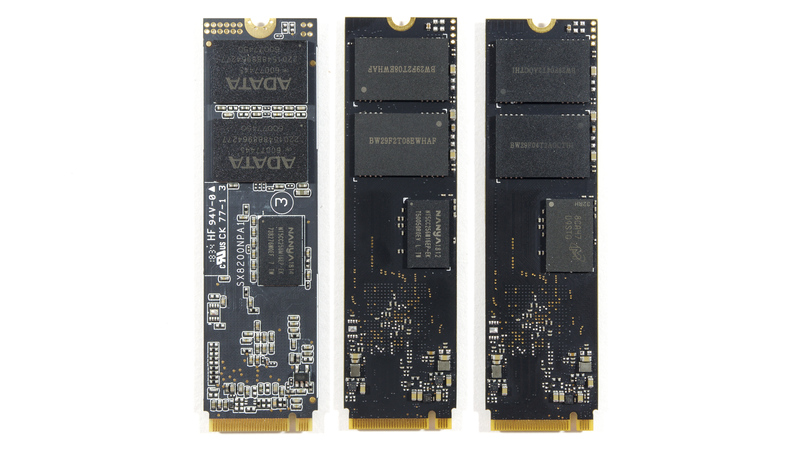 Silicon Motion's first NVMe SSD controller felt very much like a version 1.0 product. Despite any PR and marketing to the contrary, none of the products which used that SM2260 controller were able to compete with high-end drives like those from Samsung. Silicon Motion (SMI) followed it up last year with a second generation of controllers that completely changed the game: drives using the high-end SM2262 controller were able to set several performance records while being far more affordable than NVMe SSDs from the top brands. Now a new wave of high-end SMI-based drives has arrived, powered by the SM2262EN controller, a minor update to the SM2262 that makes it essentially version 2.1 of Silicon Motion's NVMe controller architecture. Last year we reviewed an engineering sample of the SM2262EN platform with an early firmware version. Today we're looking at two final retail products based on the same controller. The ADATA XPG SX8200 Pro and HP EX950 are direct replacements for two of the most successful NVMe SSDs from last year (the SX8200 and EX920, which used the older SM2262 controller). Together, those two drives have dominated the consumer NVMe market for almost a year with the best combination of high performance and reasonable prices. 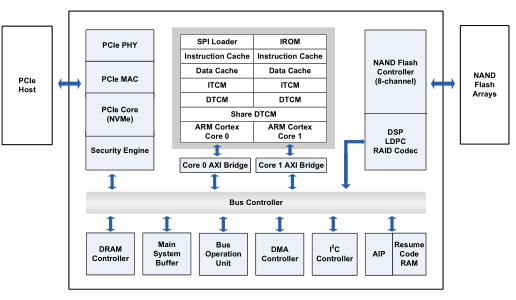 Silicon Motion still hasn't detailed what if any hardware changes the SM2262EN brings; it's still an 8-channel NVMe controller with a PCIe 3.0 x4 host interface and a pair of Arm Cortex-R series processor cores. What has changed drastically is the firmware, which Silicon Motion has tuned to provide the highest peak performance possible. This lets drive vendors advertise performance specs that rival the fastest flash-based SSDs on the market, but those specs usually don't have much relation to real-world performance. SM2262EN controller and firmware platform makes very different tradeoffs than the SM2262, and the improvements to peak performance on the SM2262EN have unavoidable costs elsewhere. The most significant advertised improvements for SM2262EN drives over their predecessors are to write speeds, with both sequential and random write performance increasing by 50% or more. Sequential and random reads have also improved, but by a more modest 10–20%. Aside from these changes, the new SM2262EN drives are drop-in replacements for the outgoing models, with similar write endurance and power consumption ratings. Prices are higher for the new models due simply to their novelty, but we expect them to fall back down to the same levels as their predecessors once supplies of the older models start to dry up (and this is already happening for some capacities). ADATA's gaming brand, XPG, has now been releasing storage drives for a number of generations. The older SX8200 was popular, and in December the company launched an entry level SX6000 Lite for the low cost market. The SX8200 is set to spring as an XPG performance drive, offering capacities from 256GB to 2TB. The first three drives are first out of the gate, while the 2TB model will be on shelves later this year. For this review, we are testing the 1TB model, which uses the SM2262EN controller and IMFT 64-layer 3D TLC NAND. 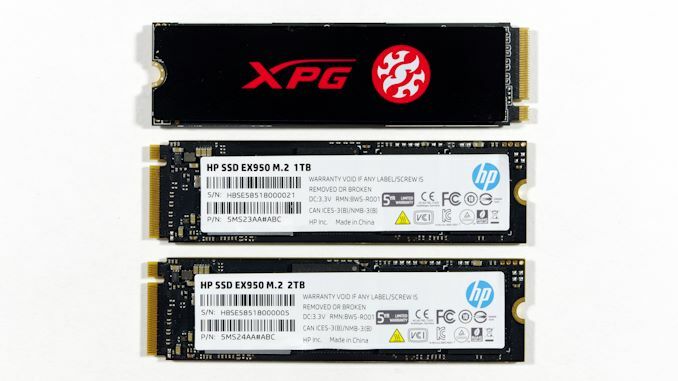 Normally HP is a name users might associate with pure OEM builds and designs, however the company has two avenues for its SSD business: to itself for its own systems, or directly to system integrators or end users. As with the other drive in this test, the EX950 is replacing a very popular drive, the EX920. HP will be offering three models, from 512GB to 2TB. All three drives are being launched simultaneously, using the SM2262EN controller and IMFT's 64-layer 3D TLC NAND. For this review, we have the 1TB and 2TB drives for testing. The specifications for the ADATA and HP drives are very similar, but there are a few minor differences. HP has dropped the 256GB model, so their lineup now starts at 512GB. Both companies have added a 2TB model, though ADATA's 2TB is not yet available and thus we don't have exact performance and endurance numbers for that one. ADATA's sequential and random write speed ratings are slightly higher, and HP's random read ratings for the 1TB and 2TB models are a bit higher. The 2TB HP EX950 is a bit unusual by offering only about 2000GB of usable space, when the smaller capacities and the ADATA drives use standard power of two capacities (~1024GB for the 1TB models). Furthermore, the 2TB HP EX950 is actually about 310MB smaller than a typical 2000GB drive. As usual, ADATA also has a more gamer-oriented model called the XPG GAMMIX S11 Pro, which differs only by the inclusion of a fancier heatspreader. The SX8200 Pro ships with a flat black heatspreader for the user to install, and the HP EX950 has no heatspreader except what is built in to the controller package. The ADATA SX8200 Pro and HP EX950 use slightly different PCBs from each other, but matching the board layouts for their predecessors. ADATA has customized the layout a bit more, putting the controller a bit closer to the M.2 connector and more of the small power regulation components between the controller and NAND. The HP drives have a layout that is very close to Silicon Motion's reference design, down to the pair of LEDs in the middle of the card that blink when the drive is active. These drives are all double-sided, so they are not intended for use in the thinnest ultrabooks. The 2TB engineering sample we tested last year used DDR4 DRAM, but neither of the retail products makes the switch from DDR3. The 1TB samples all use Nanya DRAM but the 2TB EX950 uses denser Micron DRAM. HP usually puts their own logo onto SMI controllers, but our review samples use the standard packaging with Silicon Motion's logo and part numbers. ADATA does their own NAND binning and puts their logo on the packages. The HP drives are using unbranded packages with standard IMFT part numbers for their 64-layer 3D TLC NAND. It's not about crystal disk mark score. It's about almost no one of the everyday user, playing games, surfing the web and using microsoft office, will come near your "light" test, let alone "heavy" or "torture". "Most of them need high random reads for their computer to feel snappy and responsive,"